This was a flower in the NY botanical gardens. Its called bleeding heart. In rains, it really looks like blood dripping off a tiny heart! Unique & Beautiful.. Never seen something like this before..
By the way, is Naren saying his heart is bleeding? I wonder why..
And may be we should reopen FOSLA - does FOSLA ring any bells?! 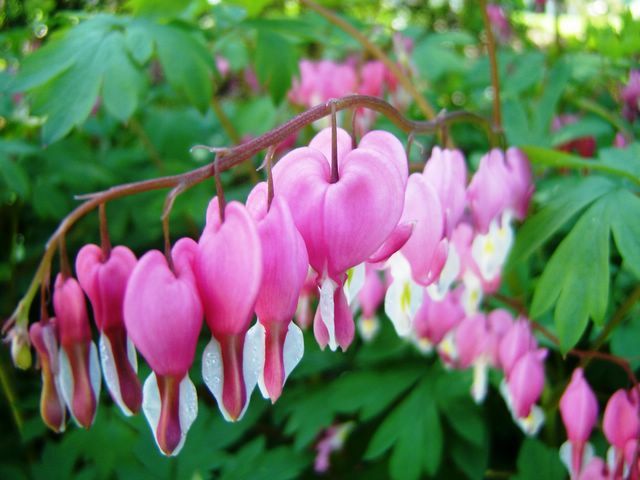 A string of bleeding hearts? omg!!! The flowers look beautiful...liked the caption of the post! BTW liked the new template also..looks cool. FOSLA?? The name sounds familiar, but I don't seem to remember the expansion..
Hey... FOSLA sounds soo familiar.. even I am not able to remember it!! VV/Naren - Thoo - you guys don't remember FOSLA?! Dammit!